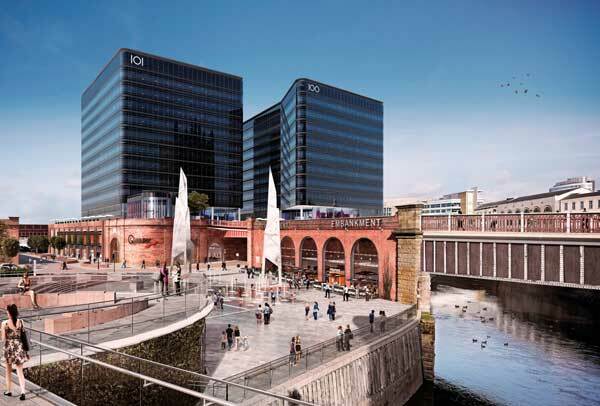 The steel-framed Embankment commercial development is the first part of a large regeneration scheme altering the area separating Manchester and Salford. Martin Cooper reports. Steel tonnage: 2,700tSet within a retained Grade II listed sandstone façade wall, and consisting of a nine- and a 10-storey office block sat atop a three-level car park podium, the Embankment scheme forms an initial phase of a much larger regeneration project that aims to breathe new life into the area where the cities of Manchester and Salford meet. On the banks of the River Irwell, overlooking Manchester Cathedral, the project is situated on a plot once occupied by Exchange Station that closed down in 1969. 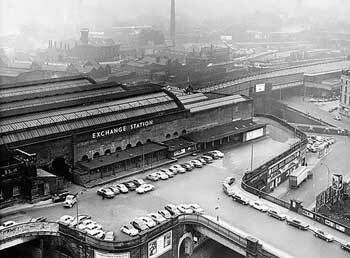 Opened in 1884, the bulk of this station was within the boundaries of Salford, although Europe’s longest platform – built in 1929 – did provide a direct link to nearby Manchester Victoria Station. Although the original buildings and platforms are long gone, the sandstone façade of the masonry podium that once supported the station has been retained, and this forms the exterior for a three-storey car park on top of which, at podium level, the two office blocks will both sit. The steel-framed car park infills most of the retained façade, except the rounded corner areas, creating 442 spaces. The main pedestrian access route from street level to the car parking levels is via the new podium hub, utilising two large arch openings in the listed façade wall. Access to the upper levels is via a lift or a feature helical stair, which rises up to a fully glazed atrium structure atop the podium. The car park has been built around a variable grid pattern to meet parking requirements and the constraints of the existing retained façade, with stability-giving cross bracing positioned within internal bays and perimeter elevations. As far as the steelwork is concerned, the car park and the first office structure (Building 101) are complete, with the second office structure (Building 100) due to begin early next year. For the duration of the construction, the façade has been propped and the steel-framed car park has been built back from the wall. The last two or three metres of the podium slab is supported by the wall and tied into it with resin fixings. The client requirement to maximise the number of car parking spaces did not permit the building cores to continue down through the podium structure. Therefore, steel-framed cores were adopted to minimise the loads onto the transfer structures, as they are significantly lighter than concrete cores. Encompassing an area around each of the building’s cores, which equates to approximately one third of their footprints, the two transfer slabs will employ an innovative design, with a 1500 thick RC slab built off a 130mm thick composite slab acting as permanent formwork. The remainder of the podium slab is 170mm thick. In order to resolve complex punching shear issues, 914UB cruciform sections were cast within the depth of the transfer slabs. Steelwork for both transfer slabs was installed as part of the initial car park construction programme in preparation for the steel erection programme for Building 100 starting next year. 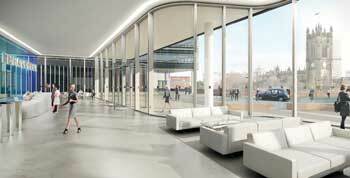 Building 101 is a 10-storey commercial block offering clear spans of up to 15.3m. Westok cellular beams, 680mm-deep with 475mm diameter holes, have been used throughout for service integration. Elland Steel Structures engaged Kloeckner Westok early in the process, who presented value engineering proposals to both Ramboll and Carillion which were adopted by the team. Kloeckner Westok Design Team Leader, John Callanan explains: “This is another example of the benefits of a collaborative working relationship between Westok, the engineer, fabricator and main contractor. Offering some aesthetic appeal around the exterior, all of the perimeter columns are CHS sections that are set within a 900mm cantilever and will be left exposed in the building’s completed form. These sections are 406.4mm diameter columns at the lower levels, decreasing to 323.9mm diameter columns for the upper two storeys. Building columns outside of the building core were generally co-ordinated with the car park layout, but where this was not possible, transfer beams were employed to take the loads into the podium columns. There are 25 transfer beams in total with the largest measuring 1,400mm-deep and weighing close to 8t. Building 100 will have a similar design to its neighbour, however it will have a larger floor area on plan but one less storey (nine-storeys), so the net lettable area is approximately the same as Building 101. This second building will include a column-free cantilever corner (6.5m projection) and will also incorporate curves to follow the shape of the listed retained façade wall. 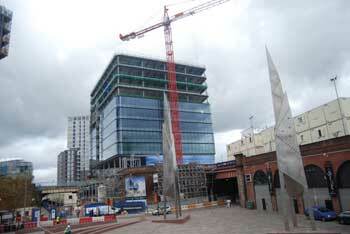 A further 1,500t of structural steelwork will be fabricated, supplied and erected for this phase. For the erection programme Elland Steel Structures began its work by firstly installing the car park steelwork directly below each of the transfer slabs. In preparation for the next phase of the construction programme, all of the transfer beams for Building 100 were also installed in readiness. 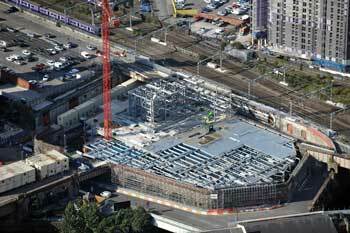 While the transfer slab was being cast Elland completed the remainder of the car park steel erection. “We then erected Building 101 using a sequence that required three levels of core to be erected, followed by three levels of main building steelwork wrapping around the core structure in a clockwise manner,” adds Mr Shorrocks. 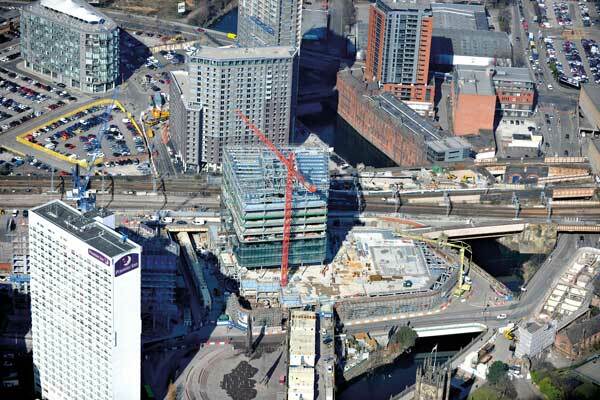 The Embankment scheme will be connected to Manchester city centre via the old station’s link bridge that spans the River Irwell. 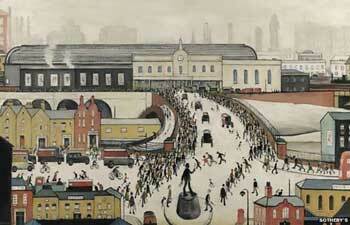 As part of the project the bridge is being renovated, including the wrought ironwork railings. A new public square, adjacent to the scheme, has also been constructed and many of the retained façade’s arches will include shops and restaurants complementing the realm. A commitment to sustainability by the client requires the buildings to achieve a BREEAM ‘Excellent’ rating, as well as achieving an efficient thermal performance, which improves on current Part L requirements. Phase one of the Embankment is due to complete later this year.